Unprocessed October Day 6’s menu is not very exciting, or for that matter very nutritious. I just didn’t really feel like eating. 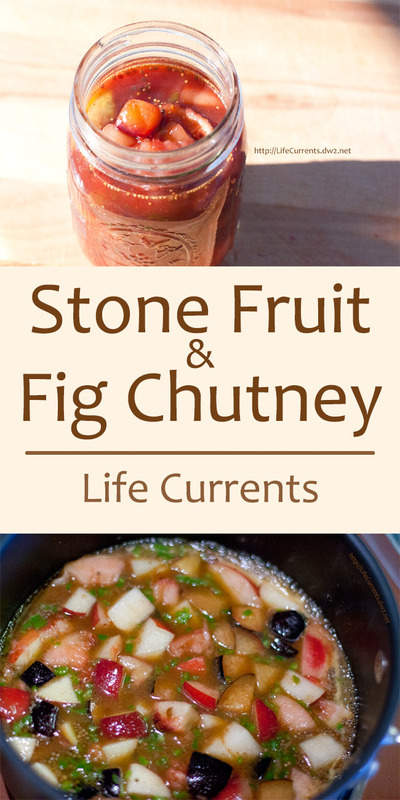 So, to make up for it, I’ll post a recipe I recently made for Stone Fruit and Fig Chutney. Sweet and savory … yummy! As a word of caution to anyone who may want to can (preserve) this, it doesn’t have vinegar in it (I don’t care too much for vinegar), so it may not preserve well. I would do a little research before I tried to can it. Stone fruits (peaches, plums, nectarines, apricots) are also in season. Pies and cobblers come to mind, but also try peach roasted chicken or plum jams. Combine the first eight ingredients (stone fruits through cinnamon). Heat oil in a medium saucepan over medium-high heat. Add mustard seeds and cook about 1 minute, covered (keeping the pan covered keeps the seeds from popping out). Add stone fruit mixture and bring to a boil. Reduce heat, and simmer about 10 minutes until mixture thickens. Stir in figs and cook an additional 5 to 10 minutes. Remove from heat and allow to cool. Serve chutney over chicken, pork, or steak. Chutney is great on a sandwich. It also makes a great gift.